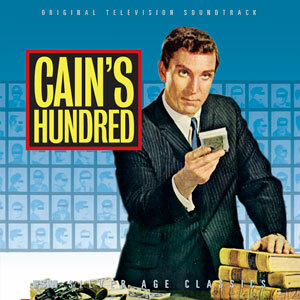 The 157th Soundtrack of the Week is the music for the television series Cain's Hundred, by Jerry Goldsmith (credited as Jarrald Goldsmith) and Morton Stevens. Cain's Hundred is a pretty obscure show from the early '60s. It ran for only one season and was about a former mob lawyer turned syndicate-smashing federal investigator. Goldsmith's music anticipates some of John Barry's work, particularly from the Bond movies. (I imagine this is just a coincidence.) The theme is an intense and moody 12/8 piece and most of the music here is characterized by tension, suspense and dread. Most of the music on the CD is by Goldsmith, but Morton Stevens took over scoring the series after a while. A selection of his work, which extends and respects what came before, concludes the CD. Film Score Monthly gets better and better, presenting something like this little known early work from a great composer. The music for Cain's Hundred is, like Bernard Herrmann's television and radio work, an inspiring example of how to create exciting music with a small ensemble (though Goldsmith's 28 musicians and Stevens's 18 made up larger groups than Herrmann's). You can see quite a bit of it on YouTube.